On the WordPress Dashboard, click the Background link on the Appearance menu. 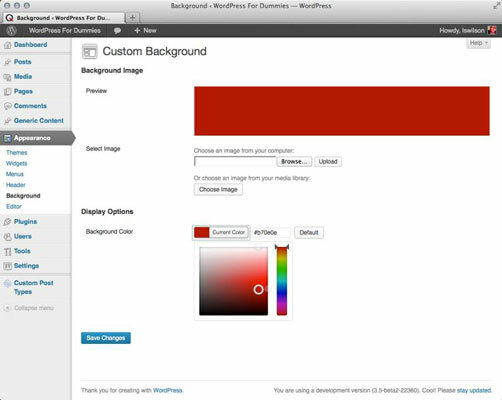 The Custom Background page opens on your Dashboard, displaying all the options for the custom background feature. In the Display Options section, click the Select Color button. The Select Color button changes to Current Color after you click it to set the color value. Color values are defined in HTML and CSS by six-digit hexadecimal codes starting with the # sign, such as #000000 for black or #FFFFFF for white. Enter the desired hexadecimal code for your selected color. Alternatively, you can click inside the color picker and select just the right color you want. The color picker automatically inserts the six-digit hexadecimal code for your color choice. Your changes are saved and applied to your site. The Custom Background page loads on your Dashboard. In the Select Image section, click the Browse button. A window pops up, asking you to select an image from your computer’s hard drive. 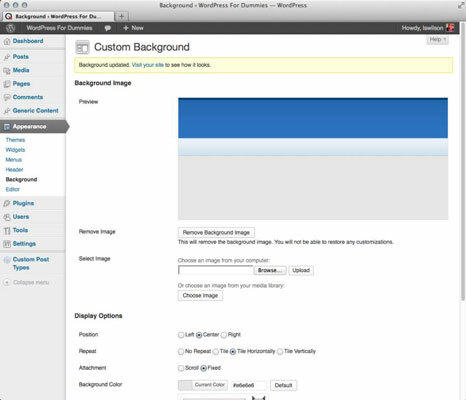 The Custom Background page reloads with your selected image in the preview area of the page. Position: This is where you want the image placed or pinned with options for image to start at the left side, center, or right side of the theme background. Repeat: This sets how you want the image to tile or repeat across the page. If you want one image without tiling, set Repeat to No Repeat. You can also set it to tile vertically (up and down the page) or tile horizontally (left and right, across the page). Attachment: This sets whether the background image scrolls with the page in the browser or is fixed in one place no matter where the page is in the browser. Background Color: This sets the solid color that displays behind your background image. After you finalize your selections, click the Save Changes button and view your site for the exact look. If you upload the wrong image from your computer or the image doesn’t look the way you hoped, there’s a convenient Remove Background Image button on the Custom Background page. Clicking this button completely removes the image from the Custom Background settings and allows you to start over with a different image.